Be sure to join us if you can for the Kids' Author Carnival at Jefferson Market Library in New York City on May 31st, 2014! Free admission to all ages, doors open at 5:30, events 6:00-8:30 pm. 38 genuine middle grade authors will be in attendance! Activities, fun, book signings. See you there! There's a difference between 1. writing a protagonist who is a person of color and 2. writing the experience of being a person of color. #2 is difficult for an author who doesn't share the same cultural background as the character. Take the marvelous scene in Christopher Paul Curtis's The Watsons Go To Birmingham 1963 where the narrator, Kenny, recounts the family's reaction to the older brother, Byron, straightening his hair. Few white writers would have had the knowledge necessary to write that scene-- the undertones of the act, and the parents' outrage, come as a surprise to most non-African-American readers. This is the kind of deep cultural knowledge that isn't available to the outside observer. #1, on the other hand, is what readers have in mind when they ask why more protagonists can't just be people of color, without it being a big deal. In fantasy, they can. And easily. Especially in second-world fantasy. In second-world fantasy, there is usually no stigma attached to varieties of pigmentation. (Hey, that's why it's called fantasy). As for cultural knowledge-- well, the writer is inventing the culture as part of the world-building. Hence any writer can dye a protagonist any color. The weird thing is... well, I did it. And sometimes people try to convince me I didn't. 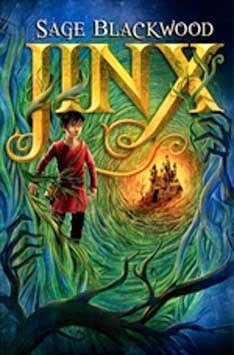 Here's the cover of Jinx. It shows a dark-skinned boy in an obviously-enchanted forest near an obviously-enchanted castle. What's weird is that often people look at the cover and see a white boy. Do you? I don't. I've probably spent more time staring at this cover than anyone. Jinx doesn't look exactly as I picture him, but I don't draw well enough to show him exactly as I picture him, so that's a moot point. His picture certainly matches his description in the book. When people try to convince me Jinx is white, I direct them to the description, and they read it and agree that yeah, it does sound like he's not white. Well. Ultimately a character exists somewhere in the space between the words a writer types and the image that forms in the reader's mind. I hope that for some readers, at least, my characters will look the way I see them. Sometimes Jinx shows up on lists of books with protagonists of color, and that makes me happy. Sometimes he's left off the lists, because Jinx's color isn't the point of the story. The same seems to be true of a handful of other middle grade novels that have come out in the last year or two. It would be nice to think that we're getting to a place where a non-white protagonist will be too ordinary to notice. Unfortunately, recent events suggest we're not getting to that place. Not yet.